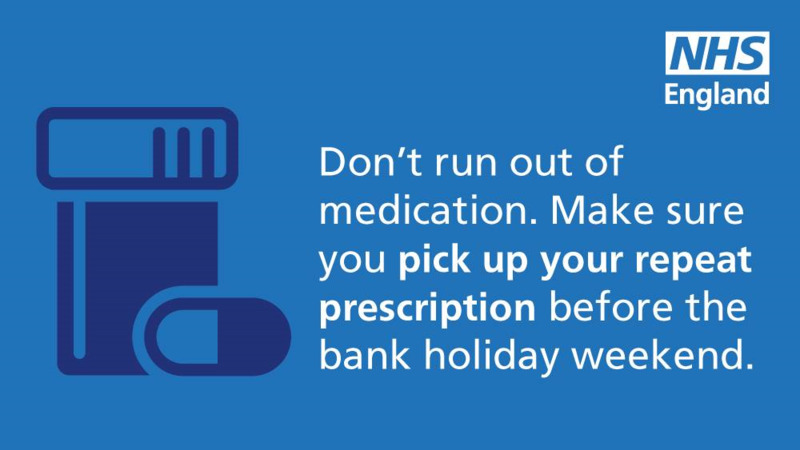 At Frizinghall Medical Centre we need 48 hours to issue a repeat prescription, so it's important to make sure it's been ordered before Tuesday 16th April. Healthwatch England wants to know what you think the NHS can do to help you and your community stay well. Healthwatch is running a national survey to ask people’s views on how local NHS services could be improved through the NHS Long Term Plan. The Government is investing £billions a year in the NHS as part of the Long Term Plan. Local services have been asked to work together to develop their own plans, which will set out how the national plan will work across local areas. You can access the surveys here. Alternative formats available here. Parents and carers, download your quick guide on what to do if your child is feeling poorly. There's lots of information about how to manage common minor illnesses at home - including coughs, colds and sickness. Get your If your child is poorly, what can you do to help your child? leaflet. Are you a Carer, an adult who may be struggling at home or feeling isolated? 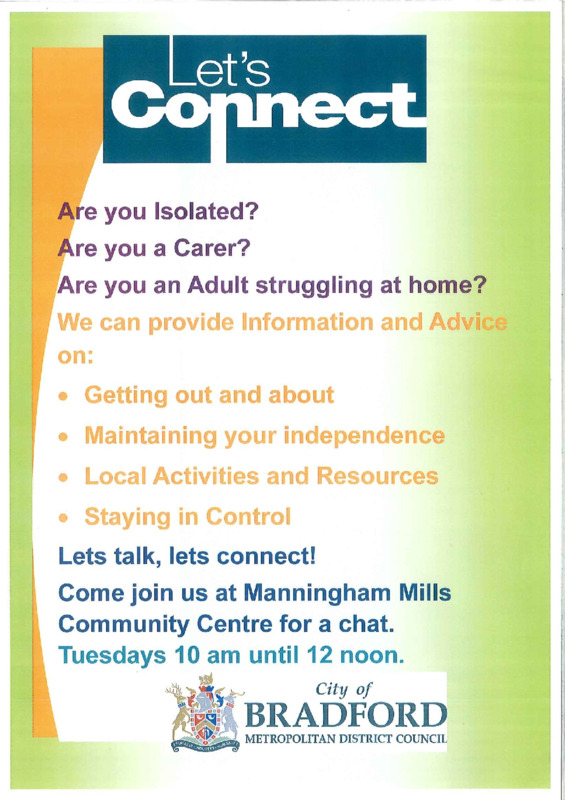 Then why not come go along to Manningham Mills Community Centre every Tuesday from 10am till 12noon, were information and advice will be provided that may be able to help you. 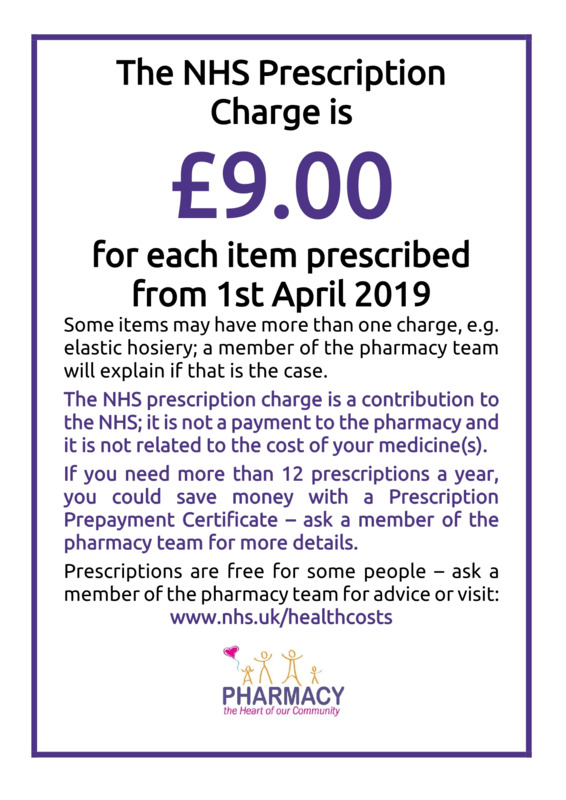 NHS England are inviting patients, NHS staff, partner organisations and interested members of the public to give their views on potential proposals for changing current primary legislation relating to the NHS, with a view to implementing the NHS Long Term Plan. 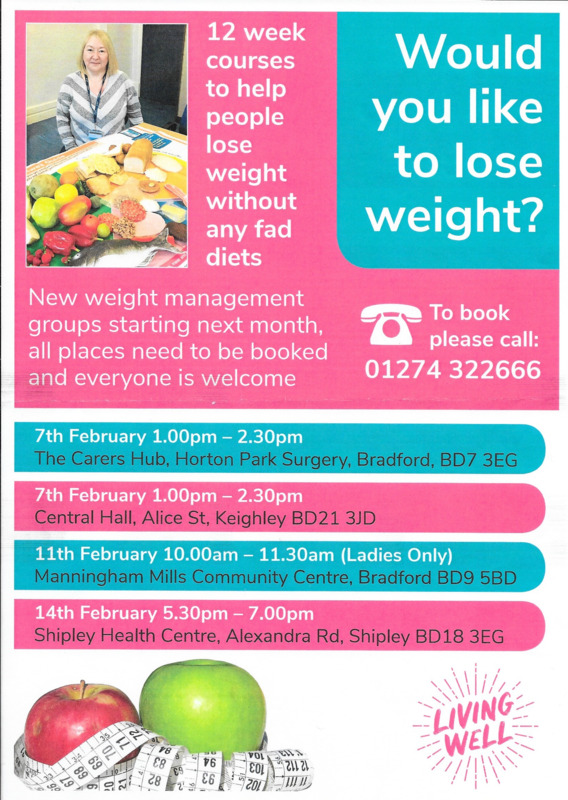 Bradford Council & Bradford District Care NHS Foundation Trust Health Trainer Service will be running some 12 week weight management groups beginning in February. 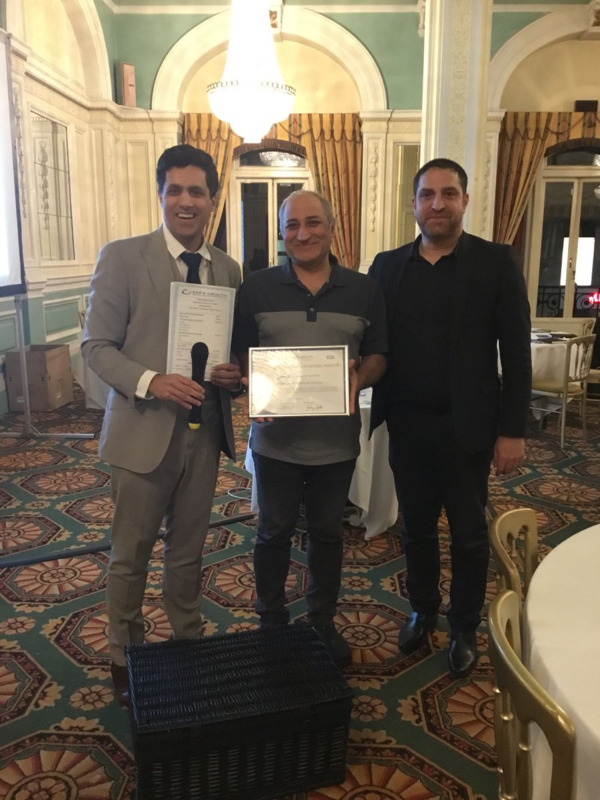 On Wednesday 23rd January 2019, at City Health Bradford GP Federation Annual General Meeting (AGM), they held their first ever “Recognising Excellence in General Practice” Awards in the Midland Hotel. We are sorry to announce that Lynda Smith, our Practice Manager will be leaving us on Thursday 28th February, we wish her all the best for the future. We welcome Mouna Allam, as our new Practice Manager who will start on Monday 4th February. A consultation is taking place about the proposed road traffic improvements for Canal Road and Keighley Road (between Shipley and Bradford Centre). As this may affect many people locally, the City of Bradford Metropolitan District Council (CBMDC), in partnership with West Yorkshire Combined Authority would like to hear people’s views on how they could be improved. 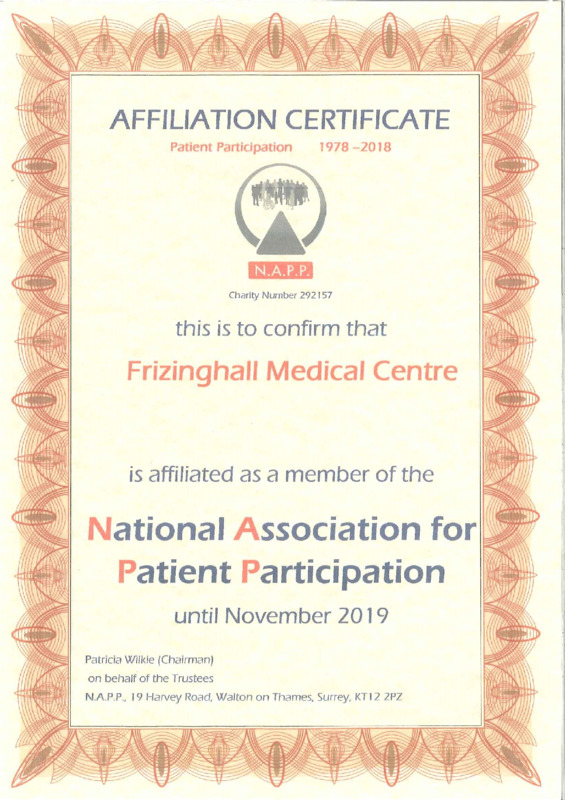 Frizinghall Medical Centre is now affiliated as a member of the National Association for Patient Participation (N.A.P.P). 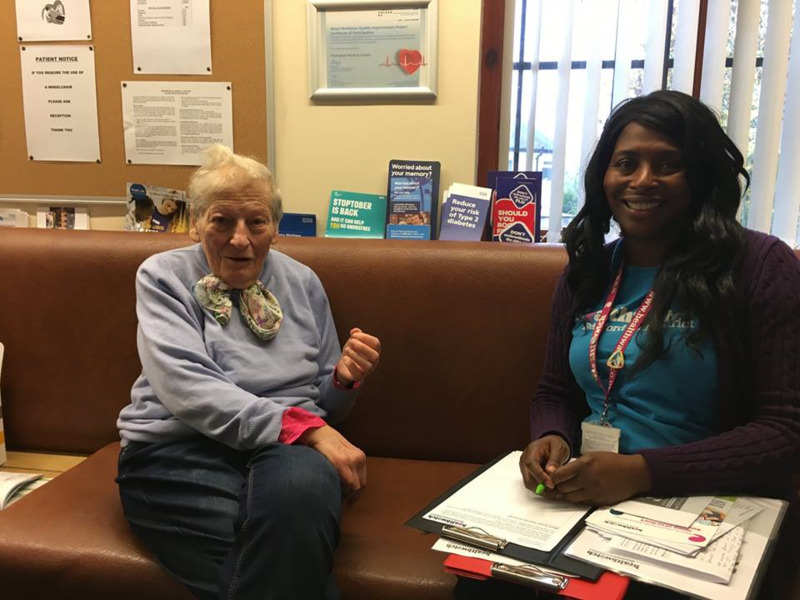 The next Patient Participation Group (PPG) is on Thursday 10th January 2019 at 4:20pm for more information about the PPG, please click here or contact Emmerson Walgrove, Patient Engagement Lead (PEL) at the surgery or via email. 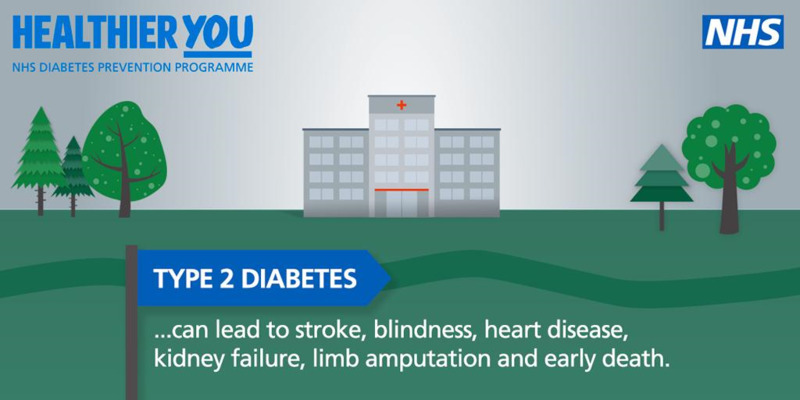 We may ask you about your health issue when you call to book an appointment. It is about helping you get the service you need. 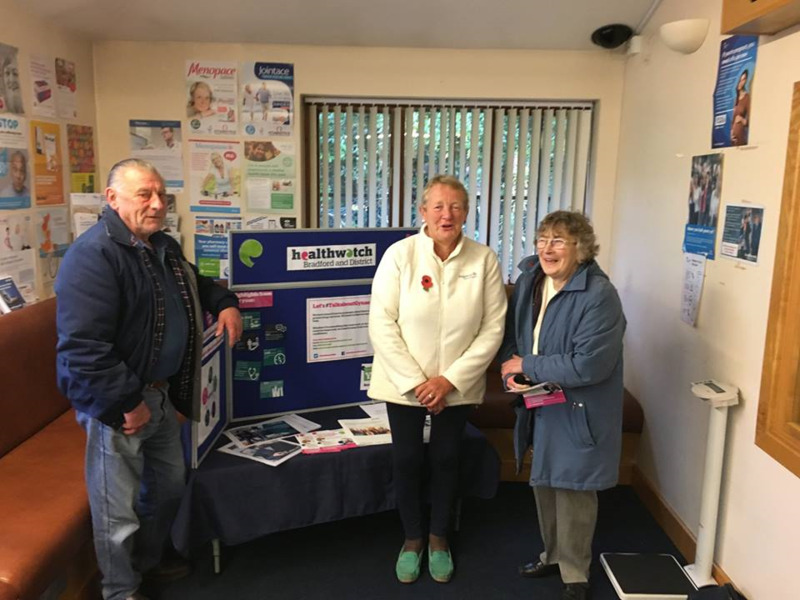 On Monday 5th November at the surgery, Healthwatch Bradford & District held a stall where about 15 of our patients give their views about health and social care services in the Bradford District. 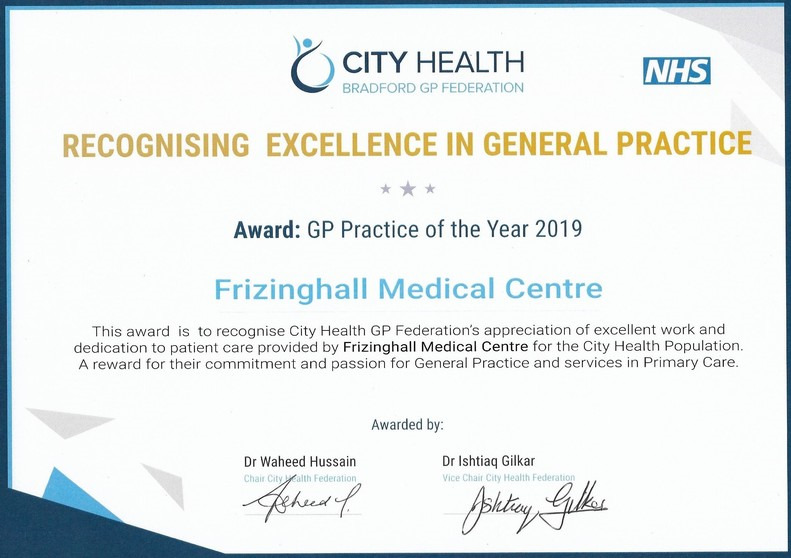 Frizinghall Medical Centre is part of the Extended Access Service which provides GP, Physiotherapy, Nurse and Health Care Assistant appointments. On Monday 10th September 2018, the Surgery was pleased to welcome our new Patient Engagement Lead (PEL) - Emmerson Walgrove. Emmerson will be more than happy to take any suggestions you may have on activities, events or services which would be beneficial to both patients and the medical centre.